The Toyota Highlander is a popular SUV for automotive buyers who need three rows of passenger seating or a considerable amount of cargo space. The current model for 2018 has a powerful yet sleek appearance that many buyers are drawn to. It notably stands apart from other large SUVs on the market because of its aerodynamic design. When you visit our Toyota dealership, you can speak with one of our friendly sales representatives about the interior changes available in this year's model. The 2018 Highlander has more cup holders and air vents than previous years. It also has an upgraded infotainment system and more rear charging ports for enhanced connectivity. These upgrades add to the reasons why you should consider buying the 2018 Highlander as your next large SUV. The 2018 Toyota Highlander is available in your choice of trim levels. The prices for these trim levels as well as their standard features vary and our sales team can help you to learn more about each trim level before you finalize your buying decision. From advanced to basic, the trim options are Limited Platinum, Limited, SE, XLE, LE V6 and LE I4. While some of the standard features vary based on your trim selection, all 2018 Highlander SUVs have some of the same standard features inside the cabin. These include a backup camera, speed sensitive volume control, a sound system paired with six speakers, reclining rear seats, adaptive cruise control, power seats for front passengers, a leather steering wheel with controls on it, power steering, power windows and door locks and more. Many SUV buyers today are concerned about horsepower when making a buying decision. Regardless of whether you plan to use your Highlander for towing or you simply want a powerful vehicle that performs well, you will be pleased with the incredible driving experience this SUV delivers. 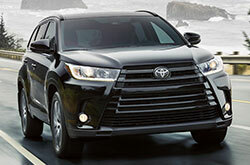 You can choose to purchase a front-wheel drive or all-wheel drive Highlander. These drivetrains are paired with traction and stability control, a stabilization bar in the front and rear, an eight-speed automatic shiftable transmission, direct fuel injection, descent control and a four-wheel independent suspension. Most of the Highlander trims for 2018 have a 3.5-liter, six-cylinder engine, and this gives you 263 ft.-pounds for torque and 295 horsepower. There are also engine options available with more and less power that you can select. 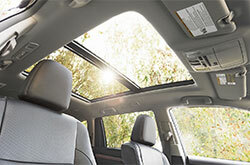 SUV buyers understandably want to find a new vehicle that can keep them and their passengers safe. At our Toyota dealership, you can learn about the many safety features that come as standard equipment in the new Highlander. 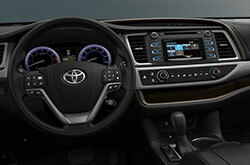 A few safety features that are available are numerous airbags throughout the cabin, headrests for each passenger, tire pressure monitoring, emergency brake assistance, turn signals in the side mirrors, fog lights, automatic delay-off headlights, daytime running headlights, ventilated front disc brakes with rear solid brakes and a pre-collision safety warning system. Safety test results for the 2018 Toyota Highlander can tell you more about how effective this combination of safety features is. U.S. News reviewed the 2018 model in the area of safety and gave it a score of 9.3 out of a possible 10 points. The IIHS tested the Highlander in five categories, and the Highlander received the highest marks possible. Likewise, the NHTSA gave the 2018 model the highest score possible in the area of overall safety.